We mounted them, down, dévalés; some are covered with a red carpet while others resist the onslaught of nature. In any case, the rise of the French markets will leave you breathless. If you liked our article about the most beautiful stairs in the world , you may imagine you climb those stairs! The black Virgin of Puy is not the least of the mysteries that hides this small town. Every era has provided his explanation to the color of the statue, but the disappearance of the original during the French Revolution left the issue open forever. There remains the possibility to follow in the footsteps of the pilgrims who were going to honor him. Climb the daunting stairs — some rest but line the 134 steps — leading to a polychrome cathedral. Built inXIIth century, crossed with Arab influences, this is one of the jewels of Romanesque art. Le Puy-en-Velay is easily accessible from Clermont-Ferrand and Lyon, train or by car. At the center of the dungeon Chambord castle stands a grand staircase with double revolution. His two helical slatted stolen are engaged one in the other, so that a person can go up and the other down by being but never cross. We tend to think today that this masterpiece was inspired by an idea of Leonardo da Vinci: a stolen quad staircase that would have served a square keep flanked by four round towers. The death of Leonardo da Vinci, the year of the opening of the site, would need to modify the project. Climb up to the terrace to see the lantern which caps the stairs and watch closely the forest of carved stones, roofs and chimneys. In the middle of XIXth century, in a park several hectares located in a valley, a former grenadier of the Emperor Claude Noisot, paid homage to his hero. He dug into the rock a staircase of 100 steps (now very degraded) to cross a cliff. The stair symbolizes the famous 100 days (1 st March to 18 June 1815) between the return of the island of Elba and the defeat of Waterloo. He also asked the sculptor François Rude, Dijon his friend, to realize an important work: Napoleon’s Awakening to Immortality. Noisot The museum contains sculpture and other memorabilia from the Napoleonic period. It is open from April 15 to October 15 (Saturday and Sunday from 14h to 18h). With 370 steps and 35 meters height difference, the monumental staircase is one of the key elements of Auscitain heritage. There proudly stands the Gers hero made ​​famous by Alexandre Dumas in The Three Musketeers: Charles de Batz, better known under the name of d’Artagnan, was entitled to his statue in bronze. Inspired by Italian Renaissance, the staircase built in 1863 is a work of neoclassical art. The climb to go from low to high city can enjoy a beautiful view over the valley of the Gers. The staircase, in an advanced state of degradation, is undergoing renovation, scheduled over several years. These are 24 steps, modest and harmless at the entrance of an austere building. But when they put on their red carpet, they sparkle with a thousand lights, surrounded by an armada of photographers and trampled by the biggest international stars. The magic of the 7 th art operates. Yet the creation of the Festival, in 1946, they did not exist. It was not until 1982 that the new building, designed by the architects Bennett & Druet, was inaugurated. Nicknamed the «Bunker», he did not unanimously, especially as the delay of the work was brushing the disaster in 1983. Since edition, this staircase has become a podium for glory. Near the Croisette and the harbor, the Festival Hall is easily accessible. Next, be sure to observe 300 stars of footprints! 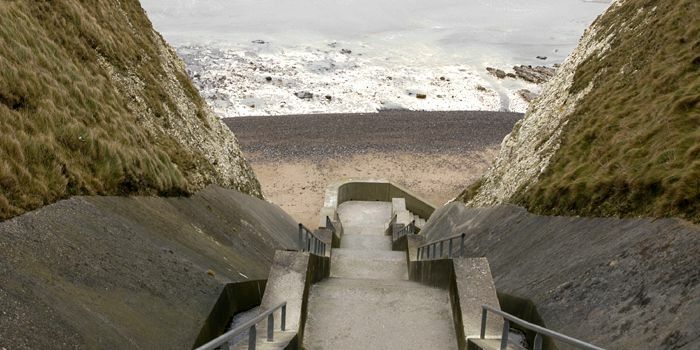 At the edge of the cliff of Sotteville-sur-Mer, a small village overlooking the Alabaster Coast upper cauchois plateau, there is a staircase carved out of chalk, which might suggest a narcotic slide towards the sea (or beach, depending on the tide). Its 231 steps assure us of a slower descent, but at peak. Built in 1890 for fishermen, covered with wood, and assorted shortly after a rail to lift the rollers for the manufacture of porcelain and emery powder, it was dynamited because of the clear strategic role that the war granted him in 1940, and rebuilt in concrete in 1954. The descent remains superb. From the square of the Church of Sotteville-sur-Mer, follow Beaumont Street, a road lined with fields leading straight to the stairs (www.sotteville-sur-mer.com). The magnificent staircases open cage, hung outside the old buildings in the courtyards of Besançon, is a very interesting feature of the city. They made ​​it possible to save space for the benefit of the apartments, and have over more airy and bright as if the stairs had been walled up. Perpetuated in past centuries, this Besancon feature often goes unnoticed to tourists eye because most buildings have private entrances. 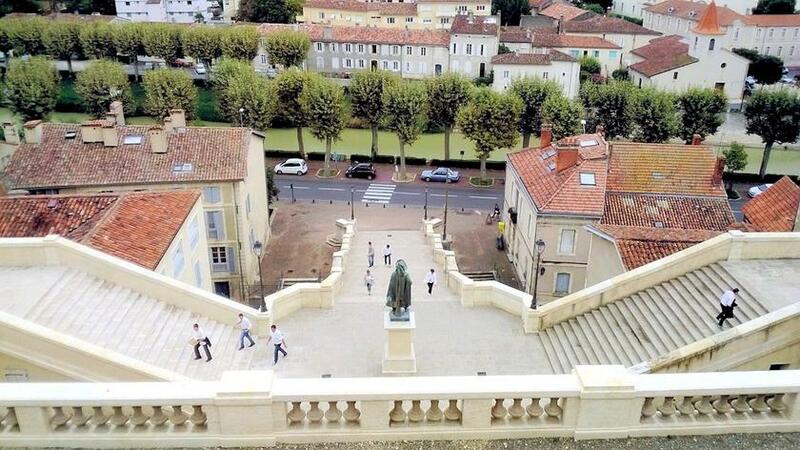 Wood, cut stone or wrought iron, there are over 200 steps of this type in Besançon, especially in the area of the loop, where installation space is particularly restricted. The tourist office (www.besancon-tourisme.com) offers two circuits dedicated to the discovery of these stairs. The legend tells that the 187 steps that connect the citadel of Bonifacio at the waves, about sixty meters below, were cut in one night by the troops of King of Aragon during the siege of 1420. More likely, this impressive scar in the limestone cliff existed since the dawn of time: this natural pass has been constantly improved since prehistory to become a real staircase provides access to a natural source vital for the population. 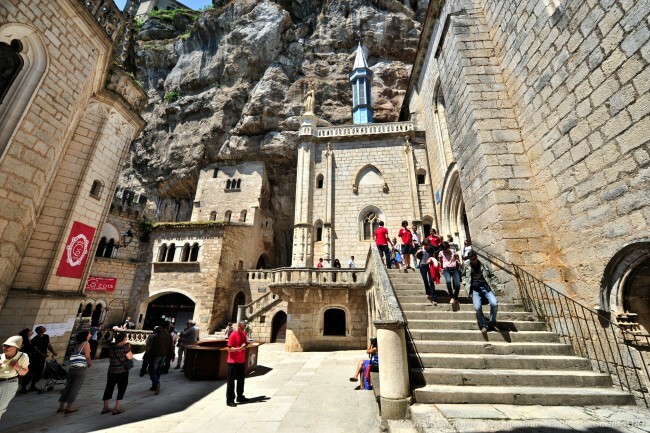 A cultural pass sold by the tourist office (3.50 €) provides access to the bastion of Etendard, the staircase of the King of Aragon and the Saint-Dominique Church. Highlight of Paris, the Butte Montmartre reaches 130 meters. A dramatic staircase of 222 steps leads directly to the summit which was built inXIXth century the imposing white basilica emblematic of Paris. On the last steps, onlookers and tourists sit to contemplate the views of Paris or watch street performances. But the real charm of Montmartre stairs is much more discreet: these are flights of stairs, lined with metal railings and lampposts old, climbing from alley to alley on the slopes of the Butte. 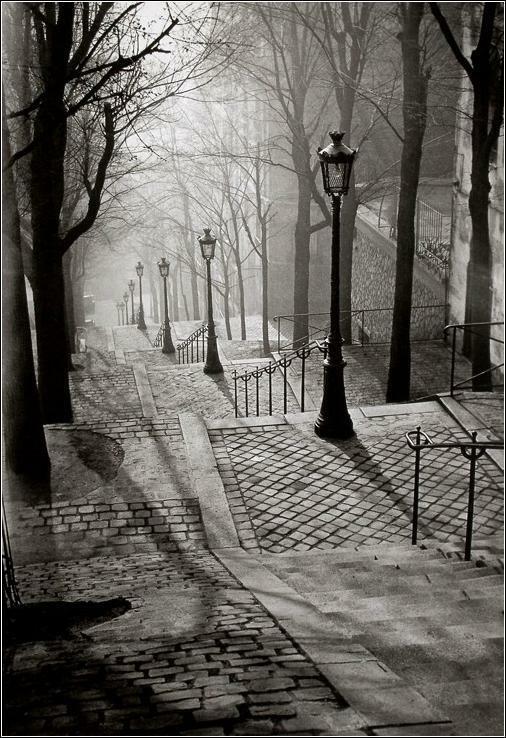 Of those who so inspired photographers Brassaï, Doisneau and Willy Ronis. A funicular and Montmartrobus also help to climb the Butte without fatigue.